As of last year, Liverpool F.C. owned 150 homes around their historic stadium, Anfield. Almost all of them were vacant. “There are thieves ripping the lead off people’s roofs,” Chris Coyle, whose mother lived among the vacants, told the Liverpool Echo at the time. This was just the tip of the iceberg: the Guardian reported that over the past decade, miscreants lit some of the blighted houses on fire, threw bricks at the few remaining residents, and in 2001 a woman using one of the vacant homes was murdered. In what one resident called “dereliction by design,” Liverpool was accused of buying properties just to let them rot, driving prices down and residents out so they could more cheaply expand Anfield. Gordon acknowledges that it’s not clear whether this was the original plan or just a lucky outcome — as he puts it, “t would be far too generous to credit Liverpool with carrying out a nefarious, coordinated plot across three ownership groups when it demonstrated so much incompetence on and off the field.” Either way, though, it’s a new twist on stadium shenanigans — I’ve seen a lot of crazy tactics over the years, but this is the first time I’ve seen a pro sports team accused of blockbusting. For anyone still in need of being disabused of the notion that new stadiums are money machines, Boston Red Sox owner John Henry explains it all for you, in the course of telling why a new building wouldn’t be a panacea for his Liverpool FC soccer team. “New stadiums increase revenues primarily by raising ticket prices — especially premium seating. 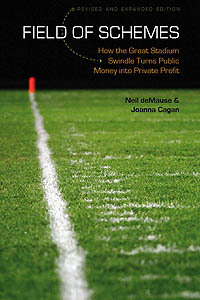 “In America, as an example, 3 NFL (American football) clubs have moved into new stadiums over the past 3 years. The New York Jets average ticket price rose by 32% when they moved into their new stadium. The New York Giants rose by 26% and the Dallas Cowboys rose by 31%. In baseball, ticket prices rose 76% when the New York Yankees moved into their new stadium 3 years ago. “At Emirates Stadium match-day revenues rose 96% the first year while seats had increased 57%. In short: The way you make money off a new stadium is by using the schmancier amenities to jack up ticket prices, not by selling more seats — something that should already have been obvious when you look at, say, the New York Yankees, who reduced the number of seats in their new stadium. And though Henry doesn’t spell it out, if refurbishing or replacing Anfield would only generate an extra £20-30 million before debt service, then it’s hardly going to be worth it, since debt service on, say, a £400 million stadium upgrade — about $600 million — would completely eat up any new revenue. So, yes, privately financing stadiums is an “enormous challenge,” at least if you’re not in a market that will support dramatic leaps in ticket prices. Or to put it another way: Most new stadiums are only worth it if you can use somebody else’s money to pay for them.